Coming up tomorrow is our flea market hot dog sale. Be there to push those dogs! 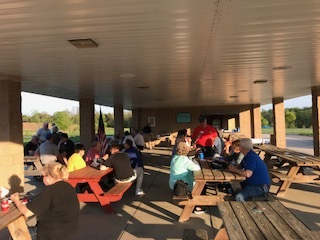 The second annual area 3 picnic was a great evening out for our club. The combination of good weather, good company and good (great) food made this event a rousing success. 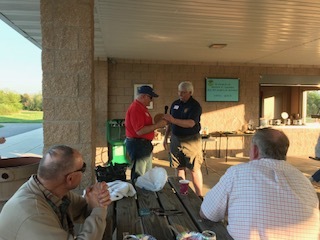 Many Rotarians from the other clubs comment about what a great place Jim Dietrich Park is. We were privileged to have District Governor Rick Gromis enjoy a good evening out with us. It was nice to see him relaxed after the District Conference was over last week-end. Maybe he was here to check up on a certain kazoo player? 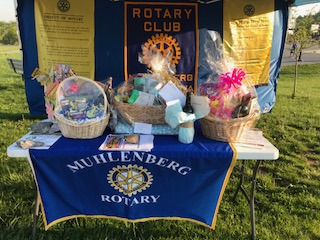 Two food items from Muhlenberg Rotarians deserve special mention. As always, Tom’s fruit basket was a work of art; we know he spends a good bit of time on it. It shows. If you didn’t try the Adams family baked beans, you missed a treat. Steve explained that his mom passed on the recipe to Karen for a special flavored dish. It must be the secret sauce. The activities this year were again handled by Fleetwood. The 10 minute game of scavenger hunt was interesting, but not drawn out. And the raffle for the baskets went really well. There were some great baskets. 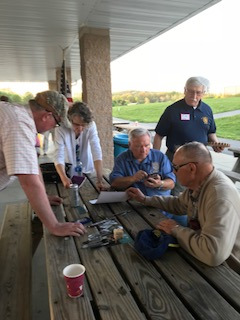 To me, though, the highlight of the evening was the presentation to our Area’s Assistant District Governor, Bob Houbaugh, Jr. Bob has long admired the wooden Rotary wheel on our podium, so we awarded him one individualized for him. We can’t repay him for all he does, but we can recognize him. This was a great evening; let’s do it again next year!